Leadership Stockton Class of 2012 chose Pixie Woods as their class project. To finance their plans, a very successful bowling event was held in September 2011. Over $12,000.00 was raised to make renovations and improvements at Pixie Woods. The jail had been destroyed by arson and the benches were broken. The class rebuilt the jail and purchased six wagon wheel benches to replace the broken ones. The benches were secured in cement. When the class first toured the park, sand bees were swarming in Neptune’s bowl. With shovels and sand bags, they removed almost two feet of sand. The bowl was power washed, primered and painted into an alien/space theme. Red bark was added as a final touch. The transformation is amazing! The decision was made to move the Pagoda from the island to an area across from the Chinese Dragon. It took a lot of elbow grease to dismantle it and ferry it across the lagoon. It, too, was power washed, primered and painted. It was moved to its new spot where it looks absolutely beautiful! The class paid $3,000 towards replacing the old, outdated sound system. To help “theme” the train route, they commissioned Pixie Woods’ artist to replace the purple hippo and circus elephant with a saber tooth tiger and mastodon. 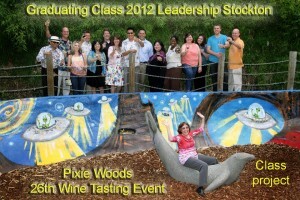 The class are also assisting the Board with their annual Wine Tasting event in June 2012. Pixie Pets got the community (including the Pixie Woods Board, Leadership Stockton class, and general animal-lovers in town) involved in various ways by helping with the pet overpopulation issue at the park. They were able to capture 6 stray dogs and get them to the shelter and rescue organizations, decreasing their risk to humans as well as themselves, and they re-homed at least one of those dogs. They also got 5 cats taken in for spay/neuter procedures and vaccinations, then replaced them back in the park to live their happy lives in their happy place on earth. They also spread the word around the community about the pet overpopulation issue at the park. LS members helped by capturing the dogs and cats, lending their pet carriers for the spay/neuter day, and going to the animal shelter to help in a volunteer capacity with the recovery of the animals after their surgeries. Dr. Goulet personally did the surgeries as well, volunteering her time and skills as a veterinarian. They also kept the cats overnight safely away from the park, then re-placed the cats back into the park after their overnight recovery was completed. Also, a little-known fact is that Dean Goold adopted one of the bunnies from the park, so while this wasn’t formally part of the Pixie Pets campaign, I think it shows how dedicated the class was to helping with the overpopulation issue and providing ongoing care for the Pets of Pixie.